Are you a rock, wind, fire, or water sign? Click here to play! Spin the reels of this astronomy-themed game and you might walk away with a new found knowledge of the stars and a whole lotta cash! As you journey through the Lucky Stars to find your sign, watch out for the oracle. This pearly orb is a substitute and will replace most other symbols to help you create more wins. It will also payout up to 10000 times your line bet if you can spin two or more across an active payline. You’ll also want to spin in the different sings as these will help you in your quest. The rock sign will grab up to 1500 times your line bet if you can spin two or more anywhere on the board. Win will get up to 300 times your line bet, while water and fire will get up to 250 times your line bet. Be sure to spin in the wheel of signs. This helpful symbol will not only help you decode your astrological chart, but it will also multiply your total bet. Plus, if you can spin three or more anywhere on the board, you will trigger a bonus feature that will see you bringing in even more wins! So, read the Lucky Stars to see if a large amount of money is in your immediate future. The Astrological wheel is a scatter. This symbol will multiply your total bet by 2, 5, 10, or 200 respectively if you can spin two or more anywhere on the board. It will also trigger a bonus feature if you can spin three of them anywhere on the board. The pearly orb is a substitute. It will replace all others, excluding scatters, to help you bring in more wins. It will also payout 10000 times your line bet if you can spin five of them across an active payline. If you can spin three or more Astrology wheels anywhere on the board, you will trigger a bonus feature. 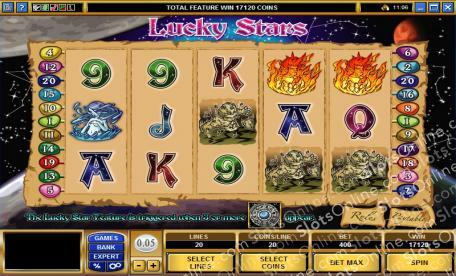 During this game, you will immediately be rewarded with seven free spins in which prizes are tripled. Then, you will be prompted to pick your astrological sign. If you choose correctly, you will get to choose from 15 free spins or a second bonus game in which you will choose from constellations to reveal cash prizes.